It behooves us why a doctor such as yourself might need to pick a lock, but we've been through this before, and we've learned not to ask too many questions. So... If you have the means to harness sound waves, radiation, wavelengths, frequencies, signals, and/or electro-magnetism (along with batteries!) AND may need to—for whatever reason—burn and cut substances, disarm weapons and electronics, amplify soundwaves, intercept and conduct teleportation, conduct medical scans, track alien life (? ), amplify audio, regenerate razor wire on a fence (also ? 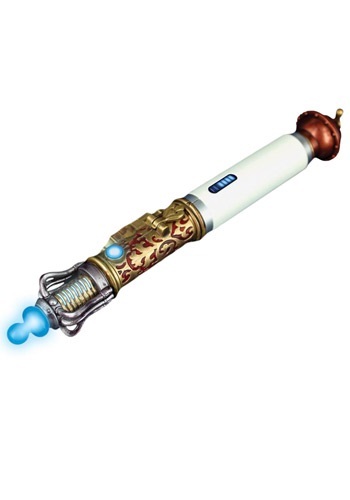 ), or remotely control devices like a thing called the TARDIS, we definitely recommend this Trans Temporal Sonic Screwdriver. What sort of medicine do you practice, anyway? Sorry, the questions thing. We're getting better about that—promise. Just take our word that this ol' screwdriver can accomplish just about anything Batman's utility belt could and more.